I don’t know about you, but I feel like this is a little out of hand. If the college you’re looking for is in the middle of the alphabet, you might have to tap hundreds of times! Thankfully, you don’t have to tap, you can at least hold down right or left to move through a little more quickly. But hey, at least it’s consistent right? This control is the same exact one used in the rest of the menu options, you just tap left or right to cycle through the choices. This is a good example of how consistency isn’t always a good thing. Different sets of data deserve different controls. Everywhere else, this control works fine because the set of data is so limited – if you’re picking your player’s jersey number, there are only so many to pick from that it’s not a big deal. This massive set of colleges though offers a way different challenge that deserves its own solution. I recently featured MLB 2K12 and how it breaks the laws of physics with a similar menu control – that’s another example of where a one-size-fits-none solution. And think about the use case of this too – gamers that are motivated enough to play the create a superstar mode, I’d guess they are likely to want to set their favorite college because they are probably going to be attached to this character. I wonder what the percentage of gamers are that see this control, figure out how it works, then immediately bail because it’s just too ridiculous? I’d wager that colleges starting with the letter “A” are super popular! So how can we fix this? Here are some potential options. 1) Skip by letter of the alphabet. If the player could use maybe the trigger buttons to skip letters of the alphabet, that would at least narrow down their search to 1/26th (or so) of the full size. The bumpers would be ideal for this, though they are already used frequently to swap between whole pages of options. 2) Use another screen. 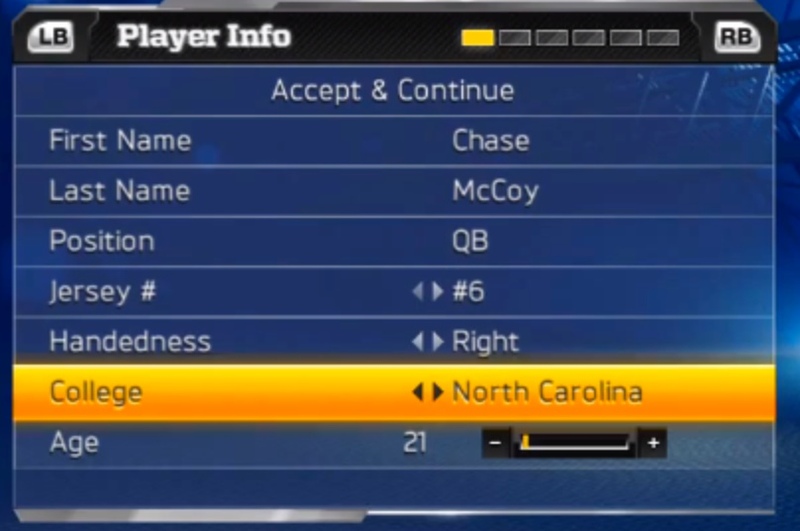 Some other, similar menu controls in Madden take the player to another modal-type of screen. These can offer a little bit more room to show all the colleges, and advanced search features like skipping by alphabet letter might be easier to handle here. Is it necessary though for this particular control? Is picking your school important enough to warrant a whole different screen? I’m not sure it is, but it would certainly make it easier. 3a) Make this an autocomplete field. I’d be curious to see some research on players’ thought process as they pick a college. For me, I’m nearly always picking my alma mater, or another local school. Basically I always know what I’m going to pick, I just need to carry it out. So then for me, it would work way better as an autocomplete field – let me type in the first few letters of the school and show me the matches. or… 3b) Filter by conference. Alternatively, if the common case is for players to browse for a college, maybe it makes sense to add a filter by conference. For these users, they might pick a familiar conference and see what schools in there strike their fancy. That sounds a lot more manageable than just wading through the entire list. In any case, the control that exists today for picking your college in Madden NFL Football is really terrible. I guess the real good news here is that the control is not at all important to the game – it’s strictly flavor (I think anyway) – so it’s definitely not mission critical. It is definitely fun though to see a QB from Saginaw Valley State University win the Super Bowl MVP, and I wish it was a little easier to make that happen. What other solutions are out there? How would you improve the usability of selecting a college? Let’s discuss in the comments below! This entry was posted in Console, Sports and tagged college selection, create a player, create a superstar, football, gamesux, madden, madden 13, menu controls, menu ui, nfl, ui, usability, usability in gaming, user experience, ux by mark d. Bookmark the permalink. Recently I hit a UX problem at work with an autocomplete field. The problem was that nobody had any idea what the actual content of the list was, so they didn’t know what to type in the field. The same problem would occur for many people with this list of colleges, especially for players outside of USA. Right, that’s a really good observation. Autocomplete fields only make sense when the user knows what they are looking for and how it’s spelled (or at least the first part of how it is spelled). Browsing is not possible/pretty terrible with autocomplete fields. I assume that non-USA players today just leave it at whatever the default is most of the time, or at least scroll through until they find the first name that sounds cool.